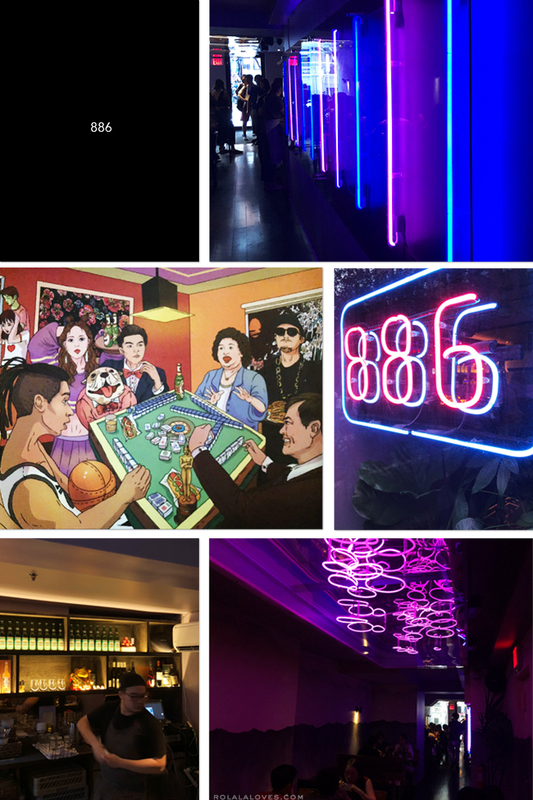 886 takes it's name from the telephone country code for Taiwan which is apt since the East Village newcomer specializes in Taiwanese food. Located on St. Mark's Place which is bustling as ever, the restaurant occupies the space that used to be home to TK Kitchen. The long narrow space opens up with a tiny bar area with seating. Dimly lit with neon light accents and colorful mural, it has an almost club-like vibe. There was a painting over our table which seemed to depict a number notable Taiwanese celebrities playing mahjong but the only ones managed to identify were basketball star Jeremy Lin on the far left and singer Jay Chou with the dog. I think that might be popstar Jolin Tsai in between them but I can't be sure. If you recognize anyone. please let me know in the comments. 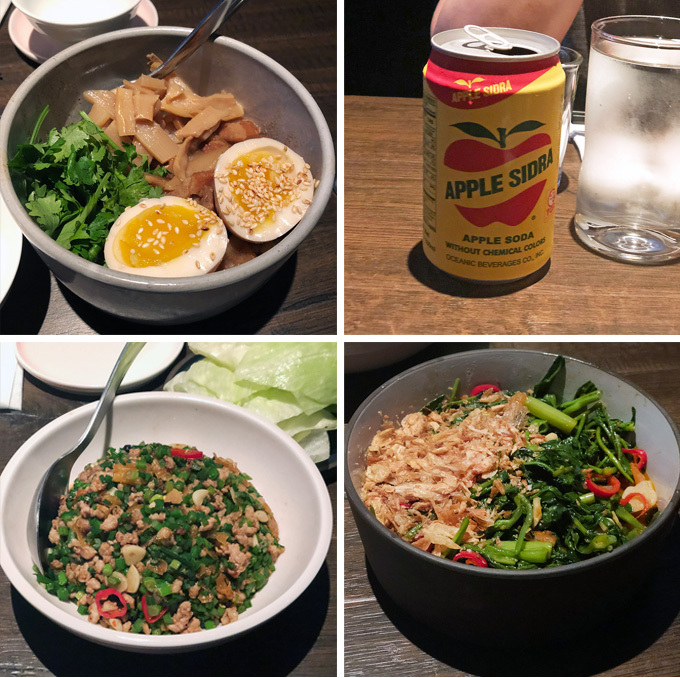 There has been a slow and steady infusion of Taiwanese cuisine in New York City recently which is certainly welcome, especially in the city itself. I know my husband misses the food of his homeland and I don't really make it often because many of the dishes are kind of time consuming. The menu at 886 features a modern take on classic Taiwanese fare. We were told that the dishes are meant to be shared and we ordered three items that sounded appealing. The first was the Lo Ba Beng (滷肉飯), a popular Taiwanese dish of braised pork over rice also known as Lu Rou Fan that is typically made with pork belly and paired with eggs, bamboo and coriander. The flavor was pretty good but as soon as we got to the rice, it had the unmistakable crunch of undercooked rice. This is a restaurant and an Asian restaurant at that. They should not be serving undercooked rice. That in itself told me all I needed to know about this restaurant. They don't care at all about quality and they're just here to make money. Now eating undercooked rice isn't dangerous but it can be really hard to digest and can lead to stomach discomfort which my husband and I both experienced. Rice is an integral component of this dish so it's absolutely unacceptable if it's not cooked correctly. There wasn't much meat and it was minced into such small pieces that you couldn't get much of it's taste or texture. There was more bamboo than anything else because that's the cheapest ingredient. We tried to eat around it but that pretty much much ruined the dish for us. We also tried the Ge Song Lettuce Cups. Pork, chives, chili, fermented black bean, garlic and shaoxing wine are stir fried together and scooped into lettuce cups to eat. The only thing we could taste was salt and the lettuce "cups" were teeny little triangles which I'm pretty sure was another cost cutting measure that made eating quite difficult. The last dish we tried was the Water Spinach & Shrimp Paste. There was more weird dried shrimp bits and chili than vegetable. Water spinach is about $1.99/lb. when it's in season and I know for a fact it was in season at the time because I but it whenever I see it. They charged $13 for this dish and again the salt was overwhelming only this time it was accompanied by an overabundance of heat from the chillies. And we couldn't order a bowl of rice because it's likely the whole pot was undercooked. Maybe I'm being too critical but I don't think so. I'm an avid home cook who happens to be very familiar with Asian cooking so I know the cost of ingredients and I have standards when I dine out. The service was somewhat congenial and very basic. It almost felt like they couldn't be bothered and wanted to get us out of there as quickly as possible. I had to ask for my water to be refilled, they never even asked us how our meal was going and after clearing our plates, they didn't ask if we wanted anything else and just briskly plopped our check onto the table. That made us feel really welcome. I didn't even mention how the hostess was pushing for us to sit at the cramped bar and threw us attitude when we said that we preferred to wait for a table. In case you're wondering, these three dishes and an Apple soda set us back over $50 with tip. Not only did they skimp out on the ingredients, the portion sizes were absolutely miniscule. But the worst thing is that they served undercooked rice. Even if it was overcooked, it wouldn't have been as bad but any decent restaurant should be able to cook rice properly. This place only accepts credit cards and are employing a tableside process on payments which is great except our server was hovering over my husband's shoulder the whole time while we were calculating the total like we were going to steal the machine. Like cool it. They also have this at Nobu and our server backed off respectfully to let us do our thing. 886 is very overrated and not worth any type of wait. Hands down this had to be the worst meal out we had this summer in terms of the food and the whole experience. And it pains me because it's a cuisine we happen to really enjoy. Never again and I've been warning everyone I know. This place is doing well now and they might be able to attract people who don't know any better for now. I get it that restaurants need to be wary of their bottom line but cutting corners to this extreme is not sustainable especially when you're willing to sacrifice quality and customer experiences. Shame on you 886. What a shame, they have so bad in quality and service. We come in a restaurant with the hope of getting good food and service but such things really make us disappointed. You go to the most amazing delicious places I need to make reservation to. Thanks for taking the time and sharing it. Have a lovely weekend. Oh wow, that is the worst review I have ever read on your blog, so I can only imagine how bad it actually was. Shame that it was so disappointing! Not that I will be in the area anytime soon, but I would make sure not to go there anyway. Thanks for your honest review... that's a shame! Aaaaaai....that is just too bad, chingu:( You would think too that in a place like NYC where the restaurant business is super competitive, one would really make the effort not to just serve great food but offer great service as well. If they keep this up, they wouldn't last long:( So weird that an Asian restaurant would get rice wrong. Like, really?!?! As always, thanks for the honest review. I must say that a restaurant that is dimly lit always sounds suspicious to me, almost like the place has something to hide. A club vibe is not very appealing in a restaurant....and looks like they really do have something to hide. I can't believe they have under-cooked the rice. That's terrible. No restaurant or any kind of place/business that serves food should make such a beginners mistake. The overall service sounds bad, I will definitely stay away from this place if I ever happen to dine in NY. Too bad since Taiwanese food does sound fascinating. 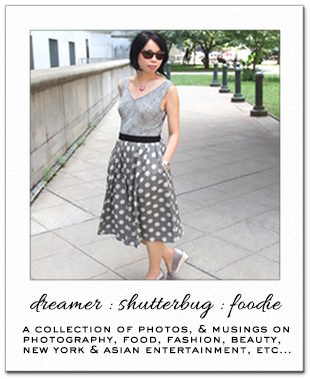 I hope you'll be able to find some other Taiwanese restaurant to enjoy. So sorry this was such a disappointing experience. Thanks for your honesty and hopefully the next time when you visit a restaurant you will be more satisfied! The service sounds absoultely terrible! That's too bad you had a negative experience at the restaurant, but I'm glad you shared this information! sad that it was such a horrible experience, the service sounds absolutely disappointing!